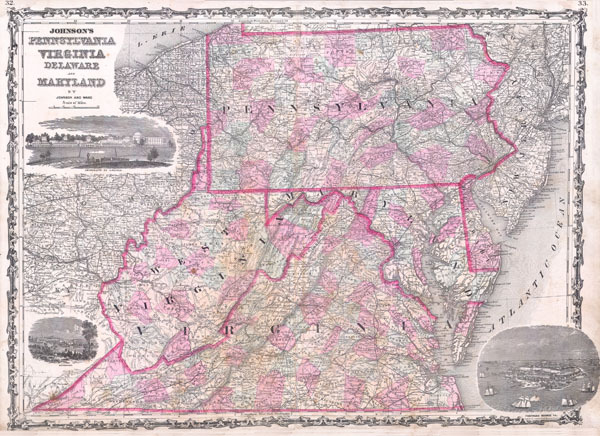 This magnificent 1863 hand colored map of the Middle Atlantic states, including Pennsylvania, Virginia, West Virginia, Delaware and Maryland, was published by American mapmaker A. J. Johnson. A beautiful and historically important map, this is the first edition of the Johnson's map to depict a partitioned Virginia. Map also includes three beautiful woodcut vignettes: the University of Virginia, Richmond, and Fort Monroe. Very good condition. Light toning on original centerfold and around Virginia. Narrow lower margin. Text on verso.